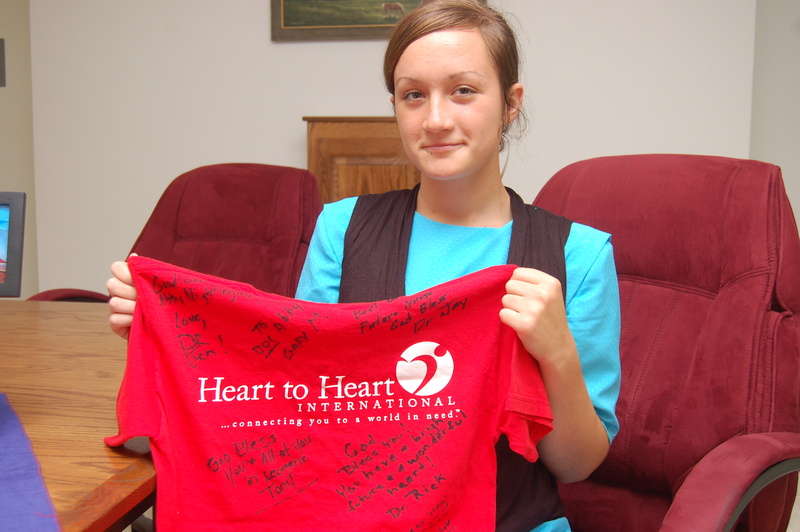 Abigail Troyer of Sugarcreek, Ohio showed of the T-shirt signed by each member of the Heart to Heart International team she assisted in the Haiti earthquake. When the earth roared like thunder, everything changed for young Abigail Troyer. The 19-year old rural Sugarcreek woman was in Haiti visiting a friend who worked at a home for poor girls in Leogane, a city of 120,000. When the massive earthquake hit on January 12, Troyer’s vacation turned into a spontaneous mission trip. With the frightening sound and incredible shaking her first thought was to exit the food storage building she was in. Troyer said she was able to stay on her feet to get out. But once outside she had to crawl on her hands and knees due to the fierce shaking. Troyer said she huddled with the staff and girls in the compound of the school, which is operated by Blue Ridge Missions, headquartered in Montgomery, Indiana. The school helps poor girls with education, hygiene and basic life skills. Troyer said one of the problems was that the tremblers kept coming every five to 10 minutes, and she wondered when they would quit. Fortunately, no one at the school was seriously hurt, although the buildings and protective concrete wall were severely damaged. Troyer said it could have been much worse, too. She said several of the girls were delayed in going into a building that was destroyed. “It was scary, especially at night,” Troyer said. “Outside in the streets it was chaos.” Fortunately, the school had a generator, which was run periodically to provide some light for security. “We also had a couple of guard dogs that protected us,” she said. “Some men from Blue Ridge Missions arrived via the Dominican Republic five days later.” All that time, the staff and schoolgirls slept outside on mats and blankets, Troyer said. Troyer has worked as a graphic designer at Carlisle Printing in Walnut Creek for two years. But her real ambition is to go to college to become a Registered Nurse. Little did Troyer know that she would get some first-hand nursing experience before she left for Haiti last New Year’s Eve. But several days after the quake, she got recruited to help the injured. An aid organization called Heart to Heart International, based in Kansas City, Kansas, sent medical personnel to assist with the multitude of injuries caused by the quake. In searching for a place to locate, members of the group came upon the girls’ school. Once she saw what Heart to Heart was doing, she volunteered her services. Troyer assisted with the injured, and boxed medical supplies for the nurses and doctors. “I helped clean wounds and wrapped bandages for six days,” Troyer said. “It was amazing to see the wounds heal in that amount of time.” She said she worked with the nurses and doctors six to eight hours a day. “Originally I went there for a vacation,” she said. “Helping like that wasn’t what we had planned, like shopping, which of course didn’t happen. Troyer did manage a few souvenirs, just not the ones she had imagined before she left Ohio. A favorite is the colorful flag of Haiti in the form of a scarf. Another is a T-shirt signed by all the Heart to Heart staff with whom she worked. Troyer has plenty of pictures that she is more than happy to share. Since her return, she has given several programs at area churches about her experiences. Laurie Mast, whose sister, Emily, works at the mission school, accompanied Troyer on the trip. They were able to return to Ohio on February 1 by way of the airport in the Dominican Republic. This vacation trip turned volunteer nurses’ aid was an experience Troyer will never forget. Furthermore, Troyer indicated that it has greatly enhanced her vision of becoming a nurse. With her confidence, courage and assertive approach to life, that aspiration is pretty certain to happen. For information about Troyer sharing her experiences in Haiti, contact her at abigailnicoletroyer@yahoo.com. This article first appeared in the Holmes Bargain Hunter, August 9, 2010.